We are aware of the bugs in the farmlists and is working on a fix. 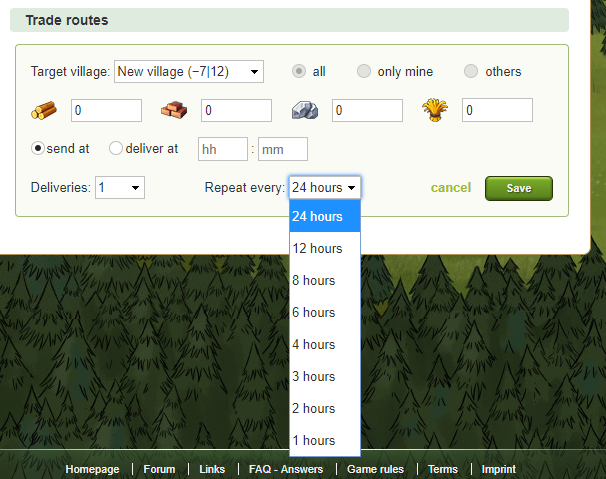 When creating a trade route, a new input entry is shown: "Repeat every X hours", where you can select a specific amount of hours. This allows to quickly create multiple trade routes at equal intervals. New design frame for videos. Added information to the alliance donation daily task that informs players when and to which amount the required contribution will increase. Units can now be set as favorites, and they will appear on top of the troops list in buildings that can train units. In Path to Pandora the alliance box has a new button: Region overview, which leads to the selected village's region. Path to Pandora: Redesign of the Embassy region overview. 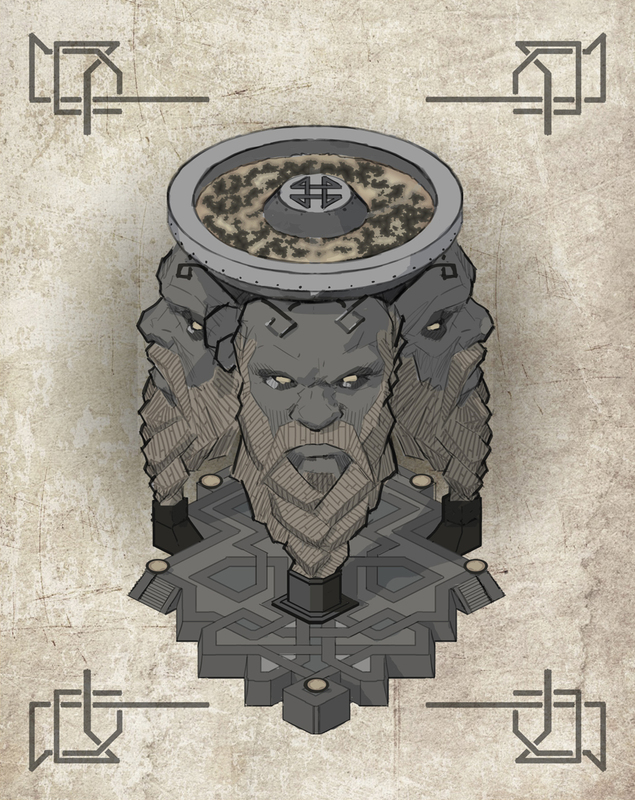 A trade route to a village containing an artifact within a confederacy will be removed once that village loses its artifact. An error message that informs a player if they forget to type in the time of the delivery while setting up a trade route has been added. The crop upkeep in reports now only shows the base values with no bonuses taken into account. Live case with Troops disappearing has been addressed. As no one answered correctly to this, there is therefore no winner for this. We're happy to announce that COM4 server will be restarted on April 24th, 2019 at 11:00 UTC+1. Units can now be set as favorites, and they will appear on top of the troops list in training buildings. A notification has been added after watching a video, which confirms the start of a building upgrade with the 25% bonus. The video player now closes after watching the A video abort notification has been added when the player clicks outside the video pop-up. PTR already have this update installed. I am more into discussing the fact that Georgi, our multihunter, is biased and does not do his job as he should. This implies that for people that still have their plus-account running, or bought gold-club, a reason for the ban MUST be given to comply to German/European law. Georgi however is refraining from delivering this to my members that got banned (I don't wish to discuss specifics). Therefor there is a possibility for the members in question to seek damages for the ban. Since Multihunters are no employees for TG itself I am guessing he is personally liable for this. Could we tell him that? Under EU law, standard contract terms used by traders have to be fair. This doesn't change if they're called "terms and conditions" or are part of a detailed contract that you actually have to sign. The contract is not allowed to create an imbalance between your rights and obligations as a consumer and the rights and obligations of sellers and suppliers. Contract terms that are unfair under EU law have no legal or binding force on consumers. - Terms which allow the trader to alter a contract unilaterally, unless the contract states a valid reason for doing so. - Terms which allow a trader to dissolve a contract unilaterally but where the consumer does not enjoy the same right. All reasons for bans are given to the player, and if you/or other players are not satisfied with the conversation with the Multihunter, you can always send an email to complaints@traviangames.com. as you might know, few communities have received combined servers recently. Now we need to combine some forums to create united space for conversations for those communities. Combining languages is a complicated process that involves quite a lot of work, and therefore we have to close the general forum for ~2 days. 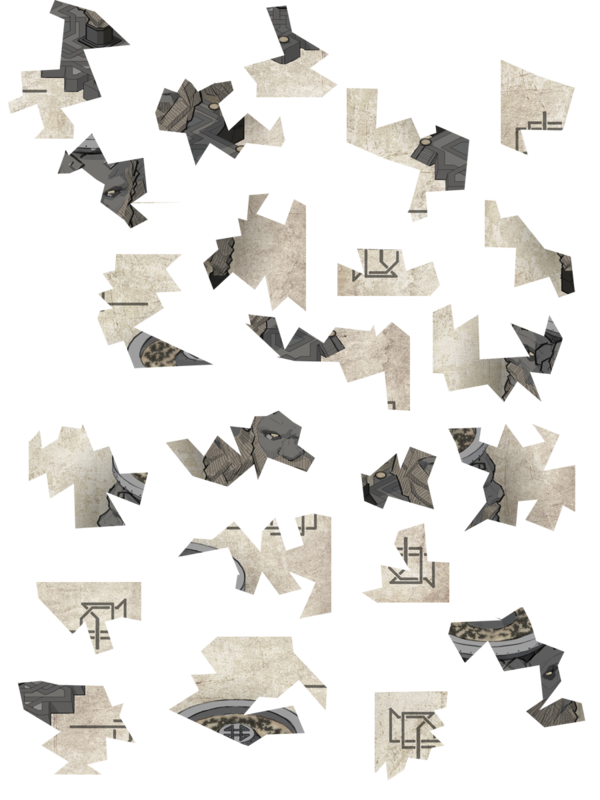 The forum will be turned to maintenance mode at 08:00 UTC+1 on April 2nd, 2019. We expect that it will get back online on April 04th, 2019 during the day. • The language pack will be renamed to the actual domain name. • Flags will be adjusted respectively. • All threads will be moved to one forum. We’re looking forward to having many active discussions on united forums. Thank you for your understanding. The link should work now. in infobox. Fixed incorrect allignment of some elements in Statistics > General. Activating interface help in tutorial does not break buttons anymore. In Path to Pandora, neighboring regions are now displayed in the region detail view. A Weekend Promo that gives 20% more gold with each purchase will soon start on all COM servers. You will get additional 20% of Gold for FREE on top of your purchase. Servers included: COM1, COM2, COM3, COM5 COM6, COMX, COM19 (PTP), COM20 (PTPx2) and COM80 (PTR). after a long and nerve-wracking fight, the first Wonder of the World of Tournament Finals was built up to level 100, on Thursday morning, 21.03.2019. The winners of Finals 2018 will be contacted during upcoming 2 weeks via email. Gold Transfer links are valid in any domain, not just on COM. The Gloria medals will be implemented around the same time. The physical prizes delivery might take up to 6 months. Please, keep in mind, that if for some reasons the physical prizes cannot be delivered to winner’s country, Travian Games will provide a voucher for Travian Gold of the same value according to p. 5c of Travian Tournament Terms and Conditions. Players, that have been banned by the time when the server is over, are excluded from the winner list. Instead, next in line will receive the prize.